Description: This is a Short, 5 Level Demo of a Hack that I am making called, "Super Mario World²". This basically aims to be on the same level of difficulty as the original SMW. Have fun with this! I'd label this hack "Easy", since there's not much threat on the way, and it's generous with power-ups and yoshis. Well, at least this demo anyways. To be honest, I didn't enjoy it. All levels are traditional "run'n jump" levels, but they're a bit repetitive, without engaging moments, though obstacles are varied in some areas, and I like extensive use of decorations to make it look more appealing. 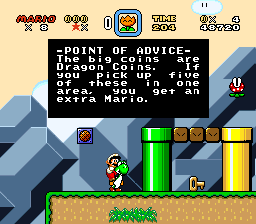 You also changed dragon coins to square coins, which is nice. And I like how submap looks. It looks quite complex and detailed with everything available in vanilla SMW. Good job! This hack is short, though you managed to miss a few errors. One of message boxes in first level says that you can't harm rexes with shells, though you still can kill them that way, like normal. You forgot to change this message box's text. 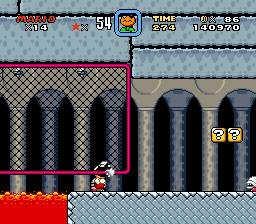 The fence here is low enough, if you're behind net and big you can stand still and not take damage, unless you duck, which is weird (and that fence door feels pointless, as there's no net koopas or anything). Also, this hack is actually 6 exits long, if you press switch in switch palace (which you didn't even touch, maybe you should've restricted access to it for this demo). Lastly, "demo" isn't a valid tag, since it's a standalone field. Overall, I think it is acceptable, but the level design is nothing special... so far at least. Curious to see how it'll progress. I wish you good luck with this hack! Thank you for the comment! I enjoy listening to other people's criticisms, and I'll try to take these into account. With that being said, I can't really work on this demo for maybe a couple of weeks, since my computer is way beyond repair at this point, and it would just be better if I got a new one, so, sorry about that. Also, I'm sorry that you didn't enjoy it, I'll try to make it (hopefully) more enjoyable for everyone to play in the final release.